She looks so lovely and regal. 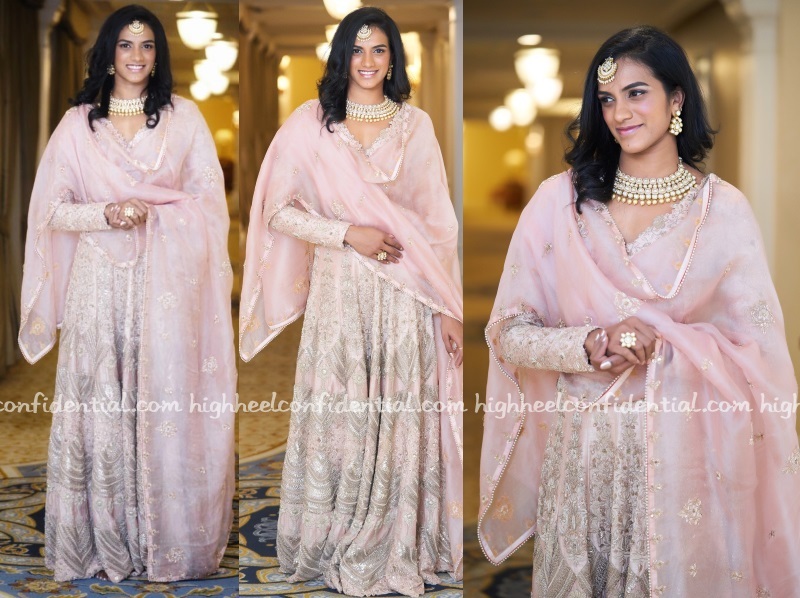 I wish Dipika herself would have taken some soft styling notes from Sindhu rather that twinning with Anuska’s Reception styling. What happened to the “no bashing the bride & groom rule”? It’s their day & event(s). Twinning! Girl, a vast majority of Indian brides dress up like Deepika and Anushka at their own wedding reception. You speak as if Anushka has just set a trend, when it’s quite normal. These subtle hints of Anushka vs Deepika crap is getting petty. We all have our preferences over who wore what better, but there is no denying that both women looked absolutely gorgeous at all their wedding events! She looks gorgeous. Such a pretty shad of pink. For once, I am liking an Anamika Khanna outfit. Way too much incoherent embroidery on that suit, the length is off and I want to straighten that maang tikka for her. Wish she opted for at least white gold base jewelry and certainly some light feeling jewelry with the outfit. There are times when wearing contrasting gold toned jewelry works – this wasn’t one of them.